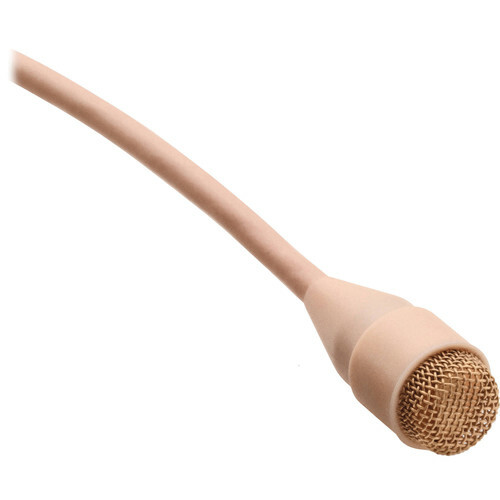 The beige d:screet 4063 Omnidirectional Microphone, Lo-Sens & Lo-DC with Microdot, Accessories and TA5F Adapter from DPA offers a clean, detailed, and natural sound quality. It is designed for use with wireless systems and can be utilized for theater, television, and close-miked instrument applications. The mic is acoustically identical to the d:screet 4060 Omni High-Sens mic, but the FET preamplifier in the input stage is designed for working with lower supply voltage. The d:screet 4063 microphone is highly unobtrusive. Because of its small size, it delivers an accurate omnidirectional pattern and does not need to be aimed directly at the sound source to achieve quality pickup. In addition, the d:screet 4063 Omnidirectional Microphone with Lo-Sens & Lo-DC includes a cable clip, concealer and mounting tape, windscreen, soft-boost miniature grid, and a high-boost miniature grid. The cable terminates to a microdot connector with a TA5F adapter for direct connection to a Lectrosonics bodypack transmitter. The adapters for wireless systems give you flexible, simple and affordable possibilities. You are no longer bound to one wireless system. As circumstances change, you can just switch your adapter, instead of incurring the cost of a whole new microphone. When you make the switch, you won't hear any loss or change in sound quality. The d:screet series of miniature microphones work with all leading wireless mic solutions, such as Lectrosonics, Sennheiser, Shure, Sony, Wisycom, Zaxcom, and many more. DPA Microphones' adapter system protects your investment for years to come. For a Lectrosonics wireless bodypack transmitter.